Today is May Day or Beltane as the ancient Celts named the day. They believed the boundaries between the human and supernatural worlds were removed and people needed to take special measures to protect themselves against enchantments. 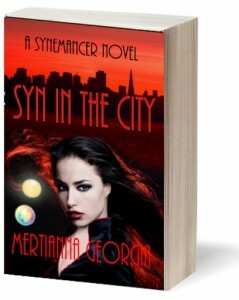 In my novel, SYN IN THE CITY, several hundred years earlier than the setting of the story, earth Mages opened a portal into an alternate universe, or Dimension as they called it, to ask for help to overcome the humans who were trying to wipe out everyone with special abilities, the magic users of their time. In our real world, Beltane brings a real and amazing astronomical feature. There are six planets aligned in the dawn sky. This phenomenon will last for the next several weeks. The planets have been hidden by the Sun recently, but now Mercury, Venus, Mars, Jupiter, Uranus and Neptune are visible in the morning sky. The ancients believed this type of planetary alignment would bring dire happenings. Well, in the story it did, but to the human inquisitors and witch hunters, because the Mages did find allies in the other dimensions, such as the Nightkind (of which the character Roman is one) and others who left their home universes to join in the fight. Eventually a peace treaty was signed and in the present day of the novel setting, people with special abilities live openly with humans and the paranormal is just an ordinary fact of life. You should be able to see the first four planets with the naked eye, but if you want to see the last two, you’ll likely need binoculars or a small telescope. Happy Beltane star gazing.